Family members, loved ones and strangers gathered at various locations this past weekend to recognize the National Day of Remembrance for Murdered Victims. Local events began as early as Friday with a 24-hour march from Firestation 65 in Watts to 77th Division Police Station in South Los Angeles. Memorial services were held in Leimert Park and several other venues throughout greater Los Angeles. The heartfelt weekend ended Sunday at the Korean Friendship Bell in San Pedro. Organized by Parents of Murdered Victims, Inc. and Assemblymember Mike A. Gipson, about 50 people gathered to pray, recite poems and solemnly ring the bell at the historic landmark. 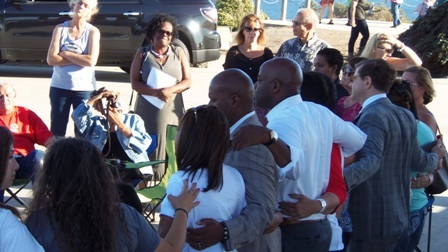 Assemblymember Gipson and Mrs. LeCresha Gipson, whose son was killed by a hit and run driver, spoke encouraging words to the gathering along with Senator Isadore Hall, L.A. City Controller Ron Galperin and Cathy Familathe, L.A. Chapter of Parents of Murdered Children. As the name of each victim was spoken a white dove was released. The afternoon ended with a promise to continue to seek justice, keep their memories alive and return next year.